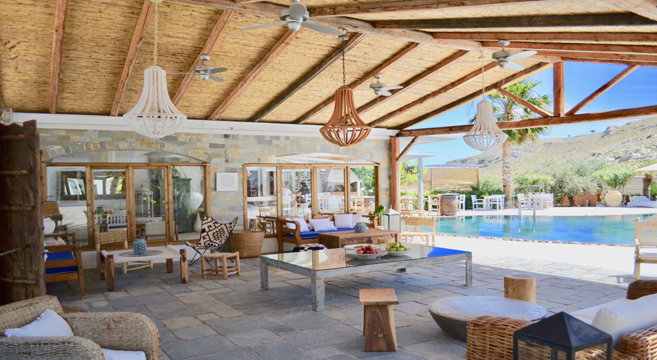 We have had a long love-affair with the island of Rhodes and the beautiful resort of Lindos, and over the years we have seen Caesar’s Gardens develop from a simple apart-hotel to a wonderful example of boutique luxury. Rhodes is the largest of the Dodecanese islands, and offers a classic combination of white sugar-cube-house, olive groves, ancient ruins and beautiful beaches. 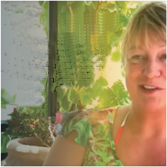 This is a sophisticated island where the resorts offer good shops, great nightlife and high quality. Rhodes Town is the historic capital, fought over for centuries and well worth visiting. 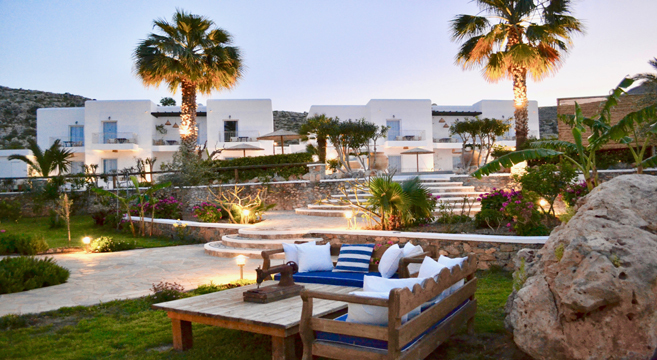 Our favourite resort is Lindos on the sandy east coast. It is a picture-postcard village of sparkling white houses set on steep cobbled streets above a sweeping beach. The crowning glory is the Acropolis at the top of the hill. The steep climb to the Acropolis is well worth the view: most guests choose not to ride one of the little donkeys that are offered for hire. 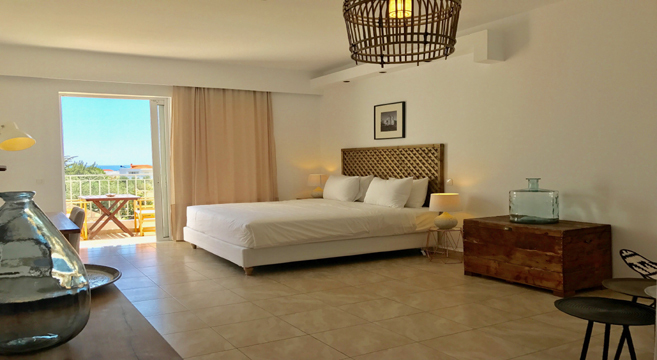 Caesar’s Gardens may now be very chic and decorated with genuine flair by Valentina and Kosmas, but the hotel retains its friendly vibe, with nothing too much trouble for the family team. This is a wonderful little hotel, and though it is not beachfront, its many fans return each year to enjoy its tranquillity, quality and personal service. This is a tranquil spot about a mile outside Lindos, with plenty of corners for tanning and holiday reading. 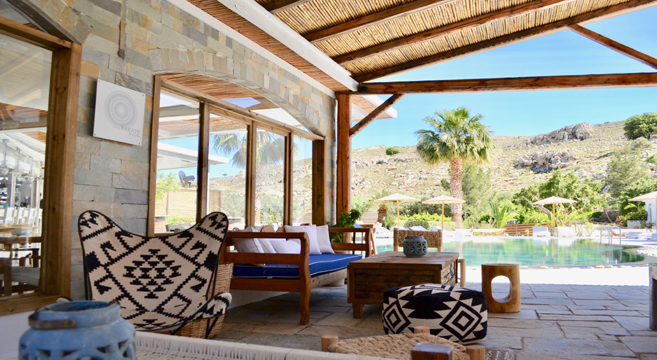 There’s barely any traffic along the track except the baker’s van or passing goats, and the vibe is so laid-back that some guests stay in and around the hotel for a truly restful week. Kosmas and Valentina have been upgrading and extending Caesar’s Gardens for several years, each year bringing an added level of luxury. 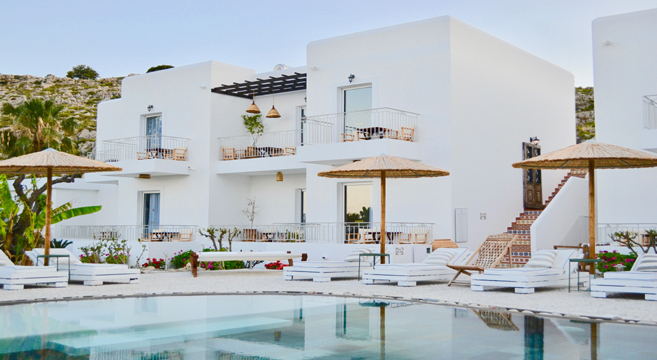 The 24 room property now combines Aegean architecture with sophisticated and quirky design and is an inspirational bolt-hole. 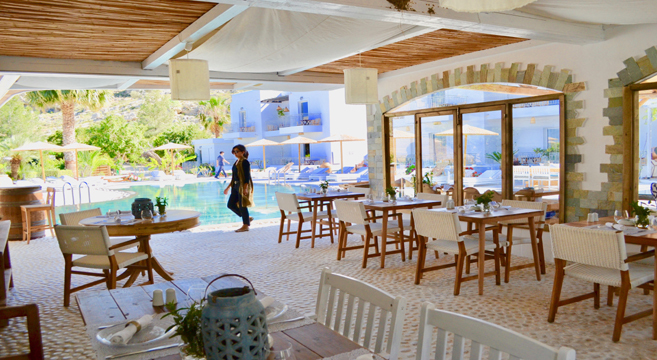 Tárate, the hotel’s restaurant and bar beside the pool combines Greek cuisine with modern creativity, using fruits and vegetables from the organic garden. You may start your day with fresh eggs from the hotel’s chickens and end the day with a fine dining experience. The chef lays on a BBQ lunch once each week, and there’s a light tea offered every afternoon. 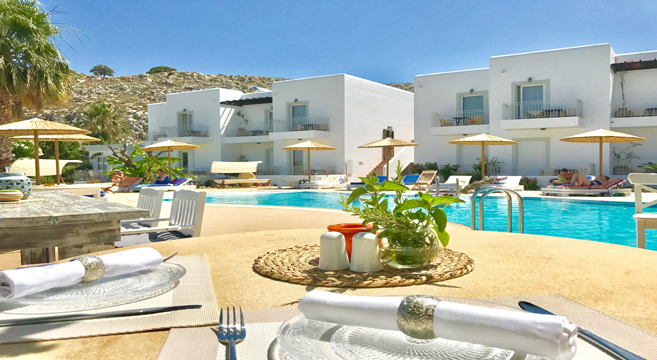 Our package also includes five dinners each week, with half a bottle of wine and water per person: we may eat ‘in’ at Tarate, or at the family’s restaurant in Lindos, or another tried and tested taverna. On the two nights when we do not include dinner, you are free to have a quiet night in or, with other Friendship Travel guests, try out a new restaurant. 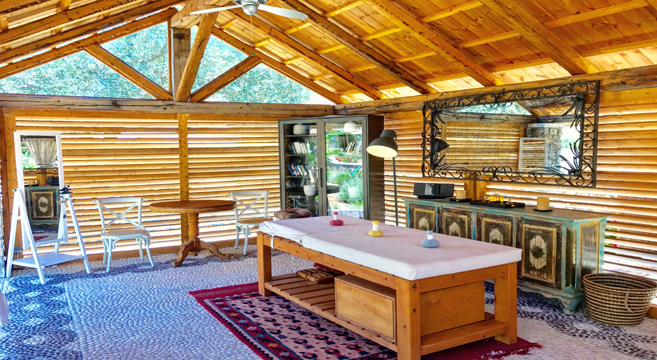 The Magnolia Spa is the hotel’s small outdoor wellness centre, where you can relax both body and mind with a massage (extra charge). We take an allocation of rooms at the hotel throughout the summer, which means we are able to offer luxurious escapes throughout the entire summer. While we do not have the hotel to ourselves, you can be sure the staff continue to deliver outstanding service to our single travellers. 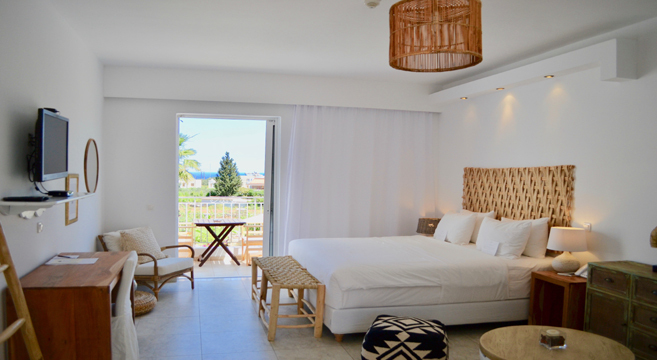 A Room Rate Levy applies all arrivals on the island from 1 June 2018 (regardless of booking date). The charge is €1 per room per night, and is collected on behalf of the Government at check-in, by the hotel. It may be paid by credit card. Rhodes is well-served by flights, and Lindos is about 45 minutes from the island’s airport. The hotel is quietly set about a mile from Lindos resort centre. For those who want to explore, the beach and the resort are both a 20 minute walk away, or a taxi ride. 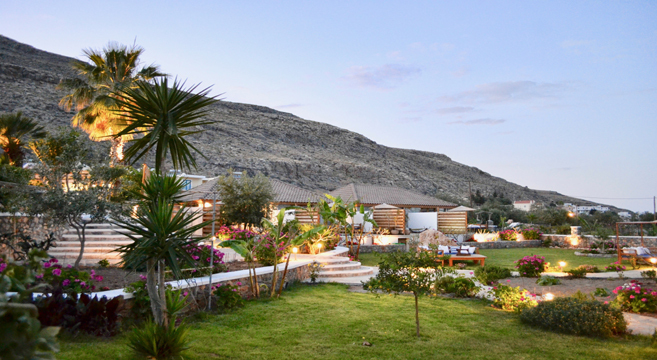 Lindos is also where you’ll find the Kaisaridis family restaurant: the original Caesar’s taverna. We may eat here on one evening during the week, but there is a big choice in the resort and your Hosts know just about all the bars, restaurants, shops and activities in the area. Our Standard double/twin bedrooms are really spacious and have been upgraded in recent years. Each has a balcony or terrace for a view of the pool, plus a desk and chair. There is a fridge and tea & coffee facilities (coffee, tea and milk provided), local toiletries in your bathroom, a mosquito net, hairdryer and flat screen TV. The hotel is happy to lend an ironing board and iron if needed. Book a 14-night holiday starting 24 April or 16 October 2019, pay Friendship Travel for 7 nights and then pay the hotel just £225 for your 2nd week - saving up to £520. ATOL-bonded flights from Gatwick. Up to 20 UK & Irish airport options: supplements may apply.